Frustrated Cities Take High-Speed Internet Into Their Own Hands : All Tech Considered College Station, Texas, is losing countless companies to towns with faster Internet, one councilman says. It's now one of several cities considering a more aggressive approach to securing broadband. 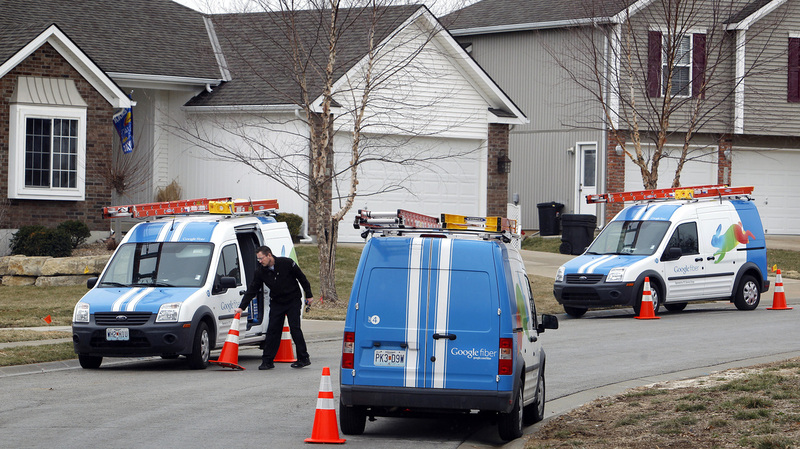 Google Fiber installers work in Kansas City, Kan., in March 2013. Cities that aren't being considered for Google's high-speed Internet, like Louisville, Ky., are trying to find ways to bring in a similar product. College Station is right in the middle of Texas — a few hours by car from Austin, Dallas and Houston and home to Texas A&M, a major research university. But if you're in the market for high-speed Internet access, College Station can feel like the middle of nowhere. "It's been pretty bleak. You get too far from the university, and it's nothing," says Andrew Duggleby, co-founder of Exosent Engineering, a company that designs and builds tanker trucks for the oil industry. "We're doing three-dimensional computer-aided design, big 3-D models," he says. "So here we are, this super-advanced engineering company, with all these technologies — but then it can't get past the walls." There is no high-speed Internet access in Exosent's part of College Station, Duggleby says. If he wants to show one of his 3-D models to a client for review, he has to copy the files onto a portable hard drive and put it in the mail. James Benham, a city councilman in College Station, is worried that high-tech jobs are fleeing to Austin and other cities with faster and cheaper broadband. "We have lost countless companies to other towns because we cannot provide the level and cost of connectivity," Benham says. Even in central Texas — not exactly a hotbed of activist government — cities are thinking seriously about how to upgrade their broadband infrastructure. "We have to deliver consistent electricity and water. I think we have to lump [connectivity] in with the critical infrastructure that we at least have an obligation to think about and plan for," Benham says. "The worst thing, I think, a city could do is sit back and do nothing and wait." Right now, only a handful of American cities have superfast fiber-optic networks. Many others are looking on with "visceral jealousy," says Susan Crawford, a visiting professor of intellectual property at Harvard Law School. "And it's disrupting what has otherwise been a very smooth, unbroken, complacent approach to communications in America." Crawford says cities need to take the lead on building fiber-optic networks because most private broadband providers don't think it's economically worthwhile. But cable and telecom companies dispute that. Comcast recently said it would offer faster speeds — but only when consumers demand it. So far, the demand simply doesn't justify the massive investment, says Fred Campbell, director of the nonprofit Center for Boundless Innovation in Technology. "The rush to fiber may be foolhardy," Campbell says. "There's a notion that we should adopt a 'build it and they will come' strategy. But it can be more efficient in the long run to meet demand as it occurs." There is one private company that's making a very big bet on very high speeds: Google. The company is offering to pay for the construction of fiber networks that can deliver speeds of up to 1 gigabit per second. Google Fiber started in Kansas City and is expanding to Austin, Texas, and Provo, Utah, this year. Kevin Lo, manager of Google Fiber, says those cities were picked carefully, based partly on their willingness to streamline their regulations and make it easier for Google to build. "Building these fiber networks is really hard. It requires hundreds, if not thousands of miles of brand new construction," Lo says. "It has the potential to be really disruptive to local communities who aren't ready for it." Google Fiber recently said it may expand to nine more metropolitan areas, including Atlanta, Nashville, Tenn., Phoenix and Portland, Ore. But even if Google Fiber built out to all of them, professor Susan Crawford says it would still only reach 3 percent of American homes. "When it comes to the national picture for high-speed Internet access, Google is barely a ripple on the surface," she says. "They're choosing places where they know they'll do well. And they're hoping that other companies and other cities will take up this mantle." Indeed, cities that have been left out of Google Fiber are thinking about how to do something similar on their own. Ted Smith, chief of economic growth and innovation for Louisville, Ky., says when the new Google cities were announced, he got hundreds of emails asking why the city wasn't chosen. Louisville, he says, is actively looking for a broadband provider to build a fiber network. "We've certainly sent the bat signal up to the sky to let people know that we will be easy to do business with," Smith says. One thing Louisville will not do, Smith says, is pay for the network itself. But Chattanooga, Tenn., did: The city's publicly owned electric company recently spent upward of $300 million on a new fiber-optic network. Chattanooga's mayor, Andy Berke, says the high speeds are helping attract new businesses to his city. "If, as a country, we're going to participate in this next round of innovation, we have to make sure the infrastructure exists," Berke says. "Someone's going to have to do this. And it makes sense that cities are going to lead the way."